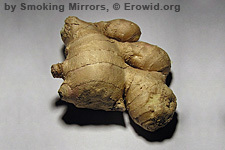 Ginger is an herbaceous tropical perennial grows 2-4 feet tall from an aromatic, tuberous root. Leaves are grass-like and 6-12 inches long. Flowers are dense, red and yellow cone-like spikes 3 inches long at the end of a 6-12 inch stalk.